Once upon a time, Luis Collazo believed his mid-March appearance on Madison Square Garden grounds would come in the form of a career-high payday versus pound-for-pound king Terence Crawford. The Nuyorican southpaw instead made the most of his consolation prize, although perhaps getting far more than he bargained for with Canada’s Samuel Vargas. 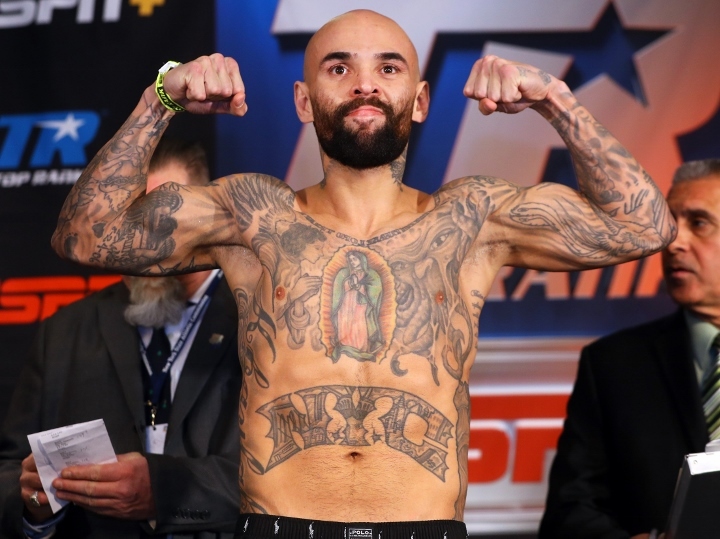 Collazo survived a stiff challenge to earn a split decision in their ESPN-televised co-feature Sunday evening at MSG’s Hulu Theatre in New York City. Vargas managed a 96-94 nod on one card, overruled by scores of 96-94 and 98-92 for Collazo in the fast-paced welterweight bout. Brooklyn-bred Collazo—fighting for the first time since a 10-round win over Bryant Perrella last August at Long Island’s revamped Nassau Coliseum—began the contest at a deliberate pace, smartly boxing and keeping Vargas at bay for much of the opening round. Given their respective styles, a boxing match was bound to break out into a fight. It became the case early in round two, as Vargas buried his head on Collazo’s chest and went to work on his midsection. The phone booth distance between the two—coupled with the dangers of a southpaw facing a conventional-stance boxer—resulting in a clash of heads which left Collazo wincing in pain from a developing bruise around his right eye. The sequence didn’t at all change the tempo of the bout or the distance at which it was fought for most of the first half of the contest. Vargas—a grizzled Colombian slugger based out of Toronto—continued to provide fits on the inside, with Collazo employing slick defense but unable to mount an effective offensive attack in the process. Collazo handled himself well every step of the way and even more so after finding his proper range in round seven. After several rounds of infighting, the former welterweight titlist was able to stick his jab and use lateral movement to force Vargas readjust. The strategy worked in drawing Vargas inside where Collazo could pick him apart as opposed to the visiting welterweight initiating a dogfight. The veteran contender did his best to maintain that distance, particularly after being briefly buzzed in round nine and also forced to contend with a stream of blood outside of his right eye. It wasn’t a throwback performance by any stretch for Collazo, but one which served as a reminder of his career-long workmanlike ring effort. He improves to 39-7 (20KOs) with the win, his third straight since returning to the ring in 2017, but with the comeback tour well spread out. The 37-year old southpaw—who enjoyed a 13-month title reign more than a decade ago—took a long break after a stoppage loss to unbeaten welterweight titlist Keith Thurman in July ’15. The heartbreaking loss came 14 months after a decision defeat at the hands of Amir Khan—the man whom landed the assignment versus Crawford which Collazo coveted. Vargas—who managed a knockdown in an otherwise lopsided loss to Khan last September—falls to 31-4-2 (14KOs). The veteran boxer—who turns 30 in April—is now 1-2-1 in his last four starts. The bout served as the televised co-feature to an ESPN tripleheader, topped by two-time Irish Olympian Michael Conlan’s 10-round featherweight clash with Ruben Garcia Hernandez. The "Old Man just keep finding ways to win! Very happy for Collazo!